Drop forged high carbon steel; chrome plated rust resistant finish; tempered and heat treated for hardness; precisely milled jaws for grip power. 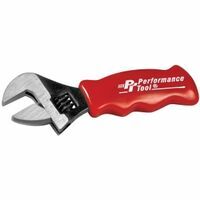 Performance Tool Adjustable Wrench, Stubby, 1 in Wrench, 6 in Overall Length, Contoured Handle Tempered chrome vanadium steel wrench for fastening or holding nuts and bolts in shop or home. Rust resistant polished chrome finish and a handy hang hole for wall storage. Exceeds ANSI specification. Carded. Made of heat treated, drop forged, chrome vanadium steel. Hardness and torque meets or exceeds ANSI specifications B107.8M. Non slip handle grip. Jaw Opening: 1.04" (26.3mm). Tempered chrome vanadium steel wrench for fastening or holding nuts and bolts in shop or home. Rust resistant polished chrome finish and a handy hang hole for wall storage. Exceeds ANSI specification. Carded. Tempered chrome vanadium steel wrench for fastening or holding nuts and bolts in shop or home. Rust resistant polished chrome finish and a handy hang hole for wall storage. Exceeds ANSI specification. Carded. Made of heat treated, drop forged, chrome vanadium steel. Hardness and torque meets or exceeds ANSI specifications B107.8M. Non slip handle grip. Jaw Opening: 1.04" (26.3mm). Wide capacity jaw allows each tool to work with more fastener sizes; wider handle provides more comfort and less stress to the hand; chrome plating for superior resistance to rust and corrosion; increased knurl diameter for easier adjustment and increased load on fastener to reduce slip-off; laser etched scale provides a quick and convenient way to determine fastener size in either SAE or metric; fully polished face. Made of chrome vanadium with English and metric scales, extra wide capacity and hang hole for easy wall storage. Protouch grips reduce hand fatigue. Meets or exceeds ANSI specifications. Wide capacity jaw allows each tool to work with more fastener sizes; wider handle provides more comfort and less stress to the hand; chrome plating for superior resistance to rust and corrosion; increased knurl diameter for easier adjustment and increased load on fastener to reduce slip-off; laser etched scale provides a quick and convenient way to determine fastener size in either SAE or metric; fully polished face. Made of chrome vanadium with English and metric scales, extra wide capacity and hang hole for easy wall storage. Protouch grips reduce hand fatigue. Meets or exceeds ANSI specifications. Made of chrome vanadium steel with 4 thread knurl and non-protruding jaws that provide greater capacity; minimal head width improves performance in confined spaces. Measurement scales (in. on front mm. on reverse) are handy for sizing nuts, pipe and tube diameters. Made of chrome vanadium steel with 4 thread knurl and non-protruding jaws that provide greater capacity; minimal head width improves performance in confined spaces. Measurement scales (in. on front mm. on reverse) are handy for sizing nuts, pipe and tube diameters. Made of heat treated, drop forged, chrome vanadium steel. Hardness and torque meets or exceeds ANSI specifications B107.8M. Non slip handle grip. Jaw Opening: 1.04" (26.3mm). Wide capacity jaw allows each tool to work with more fastener sizes; wider handle provides more comfort and less stress to the hand; chrome plating for superior resistance to rust and corrosion; increased knurl diameter for easier adjustment and increased load on fastener to reduce slip-off; laser etched scale provides a quick and convenient way to determine fastener size in either SAE or metric; fully polished face. Made of chrome vanadium with English and metric scales, extra wide capacity and hang hole for easy wall storage. Protouch grips reduce hand fatigue. Meets or exceeds ANSI specifications. Made of chrome vanadium steel with 4 thread knurl and non-protruding jaws that provide greater capacity; minimal head width improves performance in confined spaces. Measurement scales (in. on front mm. on reverse) are handy for sizing nuts, pipe and tube diameters. Tempered chrome vanadium steel wrench for fastening or holding nuts and bolts in shop or home. Rust resistant polished chrome finish and a handy hang hole for wall storage. Exceeds ANSI specification. Carded. Hardened and tempered, drop-forged, heat-treated chrome vanadium alloy steel. Spring-loaded machined knurl, precision-machined jaws. Hardness and torque meets or exceeds B107.8M ANSI Specification. Professional grade tools; "ProTouch" grips provide extra comfort and reduces hand fatigue; machined jaws for maximum gripping strength; induction hardened cutting edge stays sharper longer; set includes (1) 6" adjustable wrench and (1) 10" adjustable wrench. Same capacity as a 12" wrench; longer jaws grip better, avoiding slippage or nut round off; measurement scales (inches on front; mm on reverse) are handy for sizing nuts, pipe and tube diameters; 4 thread knurl and non-protruding jaws provide greater capacity; minimal head width improves performance in confined spaces; "Code Blue" grips are designed for durability and comfort.